In September 1986 the AX was launched to replace the ageing Visa and LNA models. Production was at the Rennes, France Factory. The AX was available in six versions, the 10E, 10RE, with 954cc engines. The 11RE, 11TRE, with 1124cc engines, and the 14 TRS and 14 TZS, with 1360cc engines. Later on in the year the limited edition AX Sport was added to the line up with twin carb 1294cc engine with 95BHP and top speed of 115 MPH. In 1987, the AX line up now included the AX GT and AX 4x4. The GT came with a 1360cc 85 bhp engine, and a top speed of 112MPH. The 4x4 came with a 1360cc 76 bhp engine, and a top speed of 103MPH. Also a range of five door models were released this year. In July of this year the AX was now available in the UK. AX Production started in this year at the Vigo factory in Spain. In 1988 the first 1360cc diesel AX's were produced with trim levels, 14 D, 14 RD and 14 TRD. A special edition of the GT was produced during this year called the AX GT Sportif. Which featured steel wheels instead of Alloys. A special edition of 1.0 AX was released this year as well called the Splash. Both The GT Sportif and Splash were only available in white. 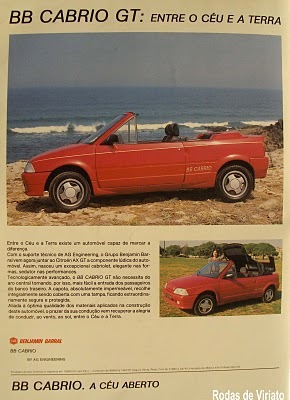 Also in this year the AX BB Cabrio was first produced in Portugal at the Benjamin Barral Citroen dealership, Portugal. It was based on the AX GT model and originally came with a twin carb 1360cc engine. It is believed about 60 examples were made. In 1989 the 14 TZS stopped production and a 5 door version of the GT appeared known as the GT5. A limited edition of the 10RE was released this year called the Night Life. They were all black with a chrome grill and Night Life decals on the sides of the car. Also in this year production numbers reached 1,000,000. The one millionth AX was a silver left hand drive, 14 TRS 5 door. In 1990, the range was rebadged to become the 10E, 10 RE with 954cc engines. 11 TGE, 11 TRS, with 1124cc engines and 14 TRS and GT, with 1360cc engines. 14 D, 14 RD, 14 TRD/DTR with 1360cc Diesel engines. A limited edition of the the 11 TGE was released in this year called the Chicago. They were all dark grey with the Chicago decal on the sides of the car and had alloy wheels. A special edition of the MK 1 AX GT was produced called the AX GT500 (UK) AX GT Volcane (France) AX GT Opera de Paris (Germany) which had half leather seats. Only 500 Volcanes, 500 Opera de Paris and 500 GT500s were made hence the name of the GT500. During this year the AX had a few cosmetic facelifts including a totally new dashboard layout and other interior changes, clear front indicators, different reversing light lense, different tail gate and different bumpers. The Facelifted model is referred to as the MK2. MK2 AXs have the bonnet chevron badge in the centre of the bonnet where as the MK1 has the chevron badge on the left hand side of the car. The AX Sport was replaced by the GTi with 100 BHP 1360cc engine with Bosch multipoint fuel injection and a top speed of 115 MPH. The GTi is the only AX to have four stud wheels as standard, as all the other AX models are three stud. In 1992, from September all petrol models were equiped with a Catalytic Converter to apply with EU regulations which stated all cars manufactured after 01/01/1993 must be fitted with a Catalytic Converter. The GTi model was now only producing 95 BHP, with the Catalytic Converter installed compared to Pre Cat models which was 100 BHP. The GT Injection replaced the GT. This featured a 1360cc engine with monopoint fuel injection system and had a Catalytic Converter. This produced 75 BHP, 10 BHP less than the Carbed, non Cat GT. In 1993, the petrol versions were all equipped with new monopoint fuel injection engines (except the GTi which had a multipoint fuel injection engine). The badging changed again to X, SX and VSX. The GT Injection was replaced by the AX Forte (UK), Furio (Europe). The Forte was available with either a 1124cc or 1360cc engine but did not have a rear spoiler or alloy wheels as standard like the GT did. A limited edition of the 1.0 model was released in this year called the Salsa. The Salsa model is blue with black bumpers and yellow Salsa decals. Also in this year the Cascade model was launched with 3 and 5 door options with 1.0 petrol or 1.5 diesel. The Cascade featured a metallic pink colour option which was popular with women buyers. In 1994 the first 1527cc diesel engine models were launced. Two limited edition models of the 1.0 petrol and 1.5 diesel models were launched this year called the Spree and Dimension. The Dimension model had velour seats. Also in this year production ended for the AX GTi, leaving the Forte as the only sporty model in the AX range. In 1995 the Elation was launched in 1.0 petrol and 1.5 diesel and the Memphis in 1.1 petrol and 1.5 diesel, both available in 3 and 5 door versions. The Memphis was a more refined model than the Elation, as it had electric windows and central locking. Also in this year the front grill changed from the straight lined grill to the honey combed style grill. In 1996 production of the Forte model ended. Production in France ended to make way for the replacement model the "Saxo". Malaysian company Proton started production of the Tiara based on the AX. The Tiara came with a 1.1 carburetor 60BHP engine in 5 door form. 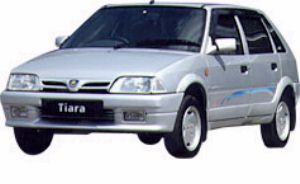 The Tiara was styled to match the rest of the Proton range of the time and was in production until 2000. In 1997 the AX production continued in Spain. 1.0 petrol models were now equipped with a 5 speed gearbox, where as before all 1.0 models had a 4 speed gearbox. Sales in the UK ended in this year, but continued on the continent. In 1998 the AX ceased production after a 12 year span. The production numbers for the Citroen AX was a total of 2,425,138 AXs being produced.